A long-eared, short-tailed, burrowing warm-blooded mammal with soft fur. Contrary to popular belief, rabbits are not rodents, like rats or mice; they are lagomorphs. Rabbits are actually more closely related to horses than they are to a rat or a mouse. Rabbits are active, playful and social. Entertaining to watch, a rabbit can be a very rewarding pet. Their popularity as a pet is growing. They are quiet and do not demand a lot of attention. Properly socialized rabbits are relatively calm and enjoy being around their people. They will allow you to hold them but lots of times they would rather not be held. Rabbits can be litter box trained. Indoor rabbits will love to hop around your house, however rabbits like to chew. If you allow your rabbit to roam free in your house or outside for that matter, be sure to keep things you do not wish the rabbit to chew out of his reach. Rabbits will chew things such as furniture, curtains and wires. You may want to look into cord protectors, found in most mail order pet supply catalogs. Chewed wires are dangerous for the rabbit and can also be a fire hazard for you. A rabbit must be provided with things it is allowed to chew such as a block of wood. Because most rabbits do not like to be held and cuddled, a rabbit may not be a good choice of a pet for very active children who may not be careful when picking them up or playing around them. Rabbits can be destructive if deprived of attention and appropriate toys. Rabbits are crepuscular, which means they are more active during twilight hours (around 10 p.m.). They sleep most of the daylight hours. Some rabbits will sleep with their eyes open. When rabbits sleep they will often twitch, and their noses stop wiggling. A happy rabbit will sometimes jump up into the air twisting and flicking its feet and head. Rabbits will show they are unhappy, startled, or warn of danger by thumping their back feet. If a rabbit grunts or squeaks when you touch it, it may be telling you it does not wish to be touched or it may be displaying territorial behavior. Rabbits that are territorial can become aggressive when you suddenly stick your hand into their territory. Spaying and neutering rabbits greatly reduces the risk of this behavior. 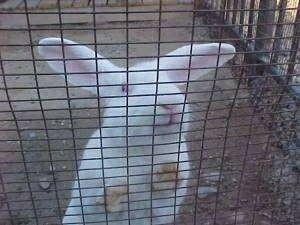 A rabbit will squeal to express extreme fear or pain. A rabbit that has never been caught by a person may squeal in fear as it is picked up from the ground. Roughly about 3-16 pounds (1.4-7.5 kg), depending on the breed. With over 50 breeds of rabbit, there are rabbits as small as guinea pigs and as big as small Spaniels and everywhere in between. Rabbits must be kept in a relatively large cage. Most rabbits are kept in outdoor rabbit hutches, however keeping in indoor rabbit is becoming more and more popular. Rabbits can be kept outdoors if they have adequate shelter. They need to be shielded from rain, wind, sun and drafts. If a rabbit is protected from the elements, they can withstand very cold weather. Some choose to use a wire cage with an enclosed box inside the cage. A 7-pound rabbit should be housed in at least a 2 foot by 2 foot house. Larger rabbits will need larger houses. Some outdoor rabbit houses have self-cleaning wire bottoms which allow the urine and poop to drop through the bottom. Outdoor rabbit hutches have an indoor area where the rabbit can get out of the elements and an outdoor area where they can go and lie in the sun. Whichever you choose, it is important that your set up is well ventilated. Your rabbit’s home should be kept clean. Their bedding should be changed every other day or so depending on how dirty it gets. Fresh bedding (straw is recommended) should be placed in the indoor areas of the hutches. Straw should be changed when it gets dirty. Some rabbits will eliminate in the back area of the hutch while others will not. Rabbits that do eliminate in their bedding will have to have the bedding changed every other day or so depending on how dirty it is. Pine and cedar wood chips should be avoided as the fumes from these beddings can cause respiratory damage. Aspen shavings, straw and hay are the best things to use for rabbit bedding. If your rabbit is an inside rabbit with a litter box, the litter box will need to be changed and cleaned fairly often as the urine can get pretty strong-smelling. Vinegar does a good job at removing urine buildup. Spaying and neutering can help to reduce urine odor. Rabbits need to have their nails clipped short so they do not get caught on the wire cage or scratch their owner’s arms. Rabbits have 4 different types of fur, normal, rex, satin and wool. Normal fur has a dense undercoat with coarse guard hairs extending past the undercoat. Rex fur is denser than normal fur and the guard hairs are about the same length as the undercoat. Rex fur stands up perpendicular to the skin, giving it a unique feel. Satin fur is fine and has a hair shaft that reflects light, giving it a spectacular sheen. Wool is found on Angora rabbits. There are actually four different types of wool found on different types of Angoras. A lot of rabbit owners with Angora coats choose to keep their coats cut short for easier care. Angora fur should not be clipped right up to the skin as the coat provides natural protection against heat, cold, and anything that may injure the skin. Be sure to leave at least 1 inch (2.5 cm) in length to the coat. Rabbits, like cats will groom themselves, however in doing so they are prone to hair balls. Brushing your rabbit at least once a week will reduce the chances of hairballs. Angora rabbits with full coats will have to be brushed more frequently. Brushing should be done more frequently during shedding season. 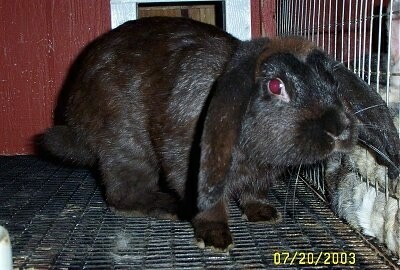 Rabbits shed about every three months. Be sure to only use a brush or comb that will not hurt the rabbit’s delicate skin. Do not trim the hair on the rabbit’s hocks and back feet or it may cause hock sores. Rabbits generally do not need to be bathed. If your rabbit is dirty in only one area only wash that area as bathing a rabbit can be very stressful for the bunny. Check ears regularly for waxy buildup or debris. Rabbit ear cleaner solution can be purchased from your vet. Dark buildup can be a sign of ear mites. Lop-eared rabbits are more prone to ear problems. Like dogs and cats, rabbits can get fleas. If your rabbit gets fleas contact your vet for the best way to eliminate the itchy bugs from their fur. A pet rabbit should be fed good quality pellets, fresh alfalfa, timothy or oat hay, water and fresh vegetables. Rabbits will enjoy freshly picked grasses, clover, herbs (be sure what you pick outside for your rabbit is pesticide free!). Water should be fed in a gravity driven bottle that hangs on the side of the hutch or cage. If a rabbit is kept outdoors in the winter, you should have several of these water bottles, rotating them with a fresh bottle several times a day as the bottles freeze. Pellets should be fresh (no more than 6 weeks old). As the rabbit gets older fewer pellets should be fed and fresh hay should be available 24 hours a day. Hay is important to a rabbit's good health; it provides roughage which reduces the danger of hairballs and other blockages. Apple tree twigs also provide good roughage for a rabbit. Some rabbits will eat their soft mushy poop, which is called cecals. This is a normal behavior for a rabbit. A rabbit’s diet of plants is hard to digest efficiently, and it will poop out lots of undigested nutrients. By eating their poop it gives them a second shot in using all of the nutrition in their food. Also, a rabbit’s poop contains vitamins produced by their intestinal bacteria. Rabbits are unable to absorb the vitamins through the intestinal wall, but can absorb them by eating the poop. Daily exercise and playtime out of the cage is a necessity. Rabbits need exercise to keep fit and stay healthy. Be sure to only let your rabbit run around in bunny proof areas (rabbits WILL chew) and where they will not be harmed by other animals such as the family dog. Portable outdoor fencing can be purchased and set up to allow a save place for your bunny to run around. You can give your rabbit toys to play with such as a cardboard toilet paper roll stuffed with hay or a small cardboard box to jump on. 5-15 years, depending on the breed. Medium and large sized rabbits tend to live longer than dwarf rabbits. Rabbits are generally healthy animals, however, rabbits can develop hairballs, diarrhea, bacterial infections, respiratory or intestinal problems, respiratory damage—caused from wood chip fumes. If you think your rabbit might be sick, contact your vet. For a rabbit, the time between mating and birth is about 28-32 days. This is only about a one-month pregnancy! They will usually have a litter of 3 to 8 babies. The newborn young are blind, deaf and hairless. Within hours of giving birth, the female (or doe) is able to mate again. She can produce up to seven litters a year. The babies themselves can start breeding as young as 4 to 5 months old. Expectant mothers will pull fur from their belly and line the nest box just prior to giving birth. It is important to have your rabbit spayed or neutered, especially if you have more than one rabbit. You may try and keep your rabbit separate but accidents happen. There are too many unwanted rabbits in the world to take the risk. There are many different breeds of rabbit. Rabbits can pretty much be found all over the world. Different breeds of rabbits have different origins. This is Lightening, a Florida White. He's a real sweetie, too. He loves attention and to play with his buddies. Owned by Emily Tiscarenio.